I don’t know about you, I have been trying so hard to grow my own set of whiskers but until now, my attempts have been nothing short of pathetic. I would lay all the blame squarely on my ancestors! Well, I guess if you can’t really grow one, there is no need to bother – so why not get a fake one instead? 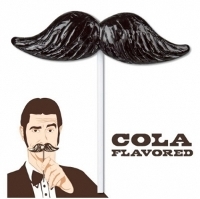 Even better still, a fake one that can also keep your sweet tooth at bay – I’m referring to the $2.95 Mustache Lollipop, where holding it up to your mouth would make you harder to spot even with the analytical skills of Sherlock Holmes, but whenever no one is looking, just give it some licks and enjoy the sweet cola flavor.